A staggering rebirth from a band that many were all too happy to leave for dead. Def Leppard are in the depths of a middle-aged rut that has lasted over twice as long as their glorious youth did to begin with. Following a celebrated adolescence in which the band became one of the leading lights of the fluidly defined New Wave of British Heavy Metal, Def Leppard quickly established themselves as the most potent commercial act of that fledgling genre, tentatively breaking through with a pair of low-charting singles off of 1981’s High 'n' Dry before really hitting pay dirt with 1983’s seminal Pyromania, also known as the album that ultimately put hair metal on its way to becoming a chart-dominating force of nature. Adversity became an unwelcome bedfellow fairly early on, with the four year interim between Pyromania and its belated follow up Hysteria seeing drummer Rick Allen lose his arm while singer Joe Elliott seemed to permanently blow out his voice, and if that weren’t enough they’d later suffer the loss of guitarist Steve Clark, who died of a drug overdose in 1991 before the follow up to Hysteria could be completed. However, in each of those cases Def Leppard were able to successfully regroup with no major drop-off in success. In that regard, their greatest adversity to date has arguably been winning their fan base back after the ill-fated Slang, the band’s regrettable attempt to modernize their sound in the direction of a grunge template that, by the time of the album’s 1996 release, had already begun to sound dated. It can be argued that the stormcloud which has hung over the band’s commercial aspirations ever since was an inevitable product of pop metal going out of style at the turn of that decade (1992’s Adrenalize was actually one of the last truly successful gasps of the dying genre). That, then, would go a long way toward explaining why more recent attempts to right the ship in a back-to-their-roots direction have largely fallen on “def” (sorry) ears. However, one thing that their pop metal efforts of the last two decades have lacked is the quality of material that fans had come to expect out of Def Leppard’s classic period. Much of that can be attributed to the declining contributions of longtime producer-slash-songwriting partner Robert John “Mutt” Lange, the man who shepherded the band through one of the biggest selling eras any artist has ever had. Lange last appeared – and then in a limited, almost cursory capacity – on 1999’s X, and Def Leppard have predictably had a tough go of it ever since. 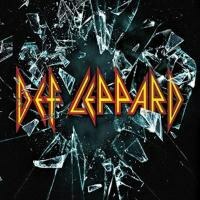 Def Leppard marks the group’s first studio foray of any kind since 2008, and it also hands down their strongest effort since Adrenalize. I would actually put it at least slightly ahead of even that record in terms of consistency, although it’s unlikely that any one song from this self-titled effort would have produced a hit song as big as “Have You Ever Needed Someone So Bad” in any year, let alone 2015; but at least this album lacks anything as overtly corny as the eye-roller “Make Love Like a Man”, or the popular-if-regressive concert anthem “Let’s Get Rocked”. The extra time spent has clearly done the band good, as nearly all of the 14 songs here are potential classics. The most notable part of that feat is that there are still no outside songwriters present – any victory lap “Mutt” Lange crossover will have to be saved for a future comeback attempt. All five members are involved in the songwriting in some capacity, and that is a sanguine sign of the quintet’s contemporary chemistry. “Let’s Go” kicks things off in cautionary mode, the track being fairly catchy but in a way that’s a little safe, not to mention too close for comfort to encore staple “Pour Some Sugar On Me”. If the remaining songs were all in this vein it would still represent an uptick in the Def Leppard career trajectory, but fortunately it continues to improve immensely from there. “Dangerous” absolutely should have been the first single off of Def Leppard and represents the first song they’ve written since 1999’s “Promises” that can stand proudly among hits from that 1987-'92 heyday. It retains most of the soft edges of that time frame in terms of overall production and, specifically, the multilayered, heavily processed chorus, but there’s an underlying crunch to the riffs that harks all the way back to Pyromania. “Man Enough” flirts precariously with a funk lite stylistic departure that could have just as easily blown up in the band’s face (its bassline bears a mild resemblance to the David Essex song “Rock On”, a tune the band has been covering in their live set the last few years) but the band succeed by avoiding the temptation to oversell it or lay it on too thick. Of course, this wouldn’t be a Def Leppard album without a few standout ballads, and for that fans of the saccharine should find plenty of satiation in “We Belong” and “Last Dance”, but where the band really impresses in this regard is on album finale “Blind Faith”, a string-laden acoustic effort that all band members save Rick Allen pitched in on. In a classic case of saving the best for last, this song is probably too complex structurally to make the grade on radio, but is nonetheless one of Def Leppard’s greatest accomplishments in a career full of award-worthy moments. This won’t be the album that turns on a legion of new fans, but that’s exactly the point: Def Leppard is fan service for the hordes of glam metal acolytes that have stuck by the band throughout their ill-fated transgressions and experimentation, each of them waiting patiently for the band to get back to their strengths, or at the very least do a better job of eschewing their weaknesses. It took 20 years to get there, but consider this mission accomplished.